The 2018 Win Green Campaign is back!! New campaign for 2018 and fresh of the FANTASTIC Golf Experience at Trinity Forest for the Sirois Shootout back in November. Like the 2017 Win Green Campaign, the 2018 WGC features 50 elite golfers from all over the WORLD who seek to “Utilize THEIR skills to benefit those in need”!!! The Win Green Campaign reached many of it’s goals for 2017 and some of the Win Greener’s really developed their skills in the process. The 2018 Win Green Campaign spans the globe (Africa, Europe, Australia & North America) in order to raise awareness for our cause, pediatric cancer. Our mission is to develop the interpersonal communication skills of these young athletes. We will develop these skills through fundraising (selling merchandise & tickets), public speaking to groups about themselves and the cause, mentorship while leading by example for others and in some cases media training through newspaper & TV interviews. In 2018 we will have 50 kids with a unified goal of raising $100,000. 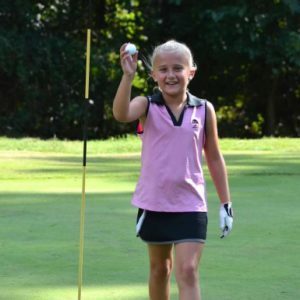 The 2018 Win Green Campaign will benefit Jax Fisher of Colleyville, TX, St Jude Children’s Hospital and other small regionalized grants will be awarded based on the success of the campaign this year. In 2018 ALL donations of $100 or greater will be entered into the Grand Prize Drawing. For every $100 increment donated you will receive another entry into the Grand Prize Drawing with an opportunity to win one of the incredible “once-in-a-lifetime” experiences. So jump on board, DONATE as many times as you like while supporting your player and helping us DOMINATE PEDIATRIC CANCER!!! $500 – Help us reach our $100,000 goal! Make a ONE TIME donation to the 2018 Win Green Campaign. For every $100 donated to the Campaign earns a spot in the Grand Prize Drawing. You may enter as many times as you would like… WE ENCOURAGE THIS and it just INCREASES your chance to win!!! Lots of incredible prizes, once-in-a-lifetime experiences all along while helping a fantastic cause in the process. Help the Win Green Campaign dominate pediatric cancer and join in the fight with Jax Fisher and 50 elite kids from around the WORLD!!! In 2018 we are proud to announce that we have many incredible prizes and “once-in-a-lifetime” experiences to give away to the Campaign donors. FOR EVERY $100 donated you will receive an entry into the GRAND PRIZE DRAWING. Enter as many times as would like as it is for a great cause and will only increase your chances to win one of these “once-in-a-lifetime” experiences. Set of PXG clubs along with a custom fitting at the PXG Headquarters in Arizona. Including airfare for 2 people. VIP Tour of of one of the biggest Studios in Hollywood and on the same day you will have tickets to a taping of a MAJOR highly rated live show being shot on the “studio lot”. Speak to your player you are supporting in this campaign for more specific details on this prize, but TRUST US, it is AWESOME!!! Tickets for 2 for this VIP experience. VIP “Experience with Martina McBride”. Meet and be the guest of Martina McBride at one of her upcoming concerts (date to be mutually acceptable to both parties). Passes for 2 and including airfare if the venue is not in your hometown. Meet & greet with a SUPERSTAR that supports the Win Green Campaign. We are keeping it a secret until it is closer to the drawing. Your player you are supporting can give you more details in person! Custom Milled and stamped putter by Tyson Lamb. The “Lamb Crafted” putter created a HUGE buzz at the recent PGA Merchandizing Show ($3000 value). Including airfare for two in order to get your putter custom fitted, receive a tour of the studio and watch how putters are actually milled. All of this in person with the Man himself, Tyson Lamb of “Lamb Crafted”. 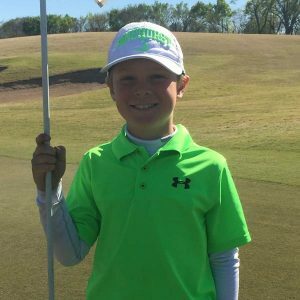 Jax Fisher, 12 years old from Colleyville, TX is the main beneficiary of the 2018 Win Green Campaign with funds raised through the 50 players and their efforts. Jax has a rare for of cancer called Ewing Sarcoma. It is a bone and soft tissue disease that has a high degree of success when detected early enough. On March 6, 2018 Jax had a procedure to remove a 10 inch portion of his femur and it was replaced with a rod and replacement bone. This was a successful procedure and it has been confirmed that all fo the cancer cells were removed with “clear margins”. It is simply amazing with the application of modern medicine, how they can clearly identify the type of cancer it is and immediately seek to remove the disease. Jax is VERY tall for his age (5’7″) and there is an extremely positive outlook for him based on the outcome of the surgery as well as how the femur will adhere to his growth plates. His career in football may have ended before it began (he didn’t play football 🙂 ) but we see a putter in his hand in the near future! Jax’s parents, Alex and Michelle, his sisters Madelyn and Brooklyn and their dog “Biscuit” have been through a lot. It is an honor to work on behalf of this awesome family for the 2018 Win Green Campaign. 1. St. Jude Children’s Research Hospital is leading the way the world understands, treats and defeats childhood cancer and other life-threatening diseases. Their purpose is clear: Finding cures. Saving children. 2. Families never receive a bill from St. Jude for treatment, travel, housing or food – because all a family should worry about is helping their child live. 3. Treatments invented at St. Jude have helped push the overall childhood cancer survival rate from 20 percent to more than 80 percent since it opened more than 50 years ago. St. Jude is working to drive the overall survival rate for childhood cancer to 90 percent, and won’t stop until no child dies from cancer.